Health Minister Malcolm Chisholm has avoided a no-confidence motion in the Scottish Parliament after announcing a reprieve for an under-threat hospital. 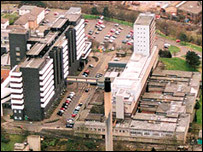 The Labour politician rejected health board plans to close the Queen Mother's Maternity Hospital in Glasgow. Instead, he wants a new hospital in the city, which would combine maternity, paediatrics and acute adult services. A Tory attempt to force him from office was cancelled out when a majority of MSPs gave the minister their support. The Conservatives had proposed the no-confidence motion because of anger at Mr Chisholm's hospital reforms. They used opposition debating time at Holyrood on Thursday in an attempt to force a vote on the minister's competence. David McLetchie, the Scottish Tories' leader, said they wanted to put the focus on the Labour and Liberal members who have been making a "song and dance" championing local hospital services. "They want to be the local heroes, but the issue is, are they going to the villains when they get to Holyrood and be bought off by something which is wholly inadequate and will do nothing to stop the march towards centralisation of the NHS in Scotland?" he said. However, 66 MSPs voted to strike out the text of the Tory motion by backing Mr Chisholm's amendment, which acknowledged concerns over proposed centralisation of health services but endorsed the executive's policy. Fifty-nine MSPs voted against the executive amendment. The amended motion was backed by 66 votes to 54, with five abstentions. 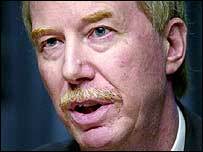 However, lone Labour rebel Bristow Muldoon warned that the issue would not go away. The MSP, who is campaigning to reinstate emergency surgical services at St John's Hospital in Livingston, warned that the vote might not go the executive's way next time. Mr Chisholm denied that his decision to make the announcement on the same day as the no-confidence motion was a cynical move. "The reason for doing it today was because it was the day after the spending review," he told BBC Scotland. "Obviously there was a considerable sum of money attached to the particular way forward that I mapped out today." He said he had become "increasingly convinced" during the summer that the service should be preserved. 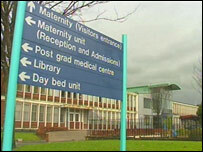 Greater Glasgow Health Board voted to close the hospital in April, subject to ministerial approval. But medical staff warned that babies' lives would be at risk if the relationship between the Queen Mother's and Yorkhill's Royal Hospital for Sick Children, which is on the same site, was lost. Mr Chisholm told MSPs that he had given a great deal of consideration to maternity services in Glasgow and had meetings with doctors, nurses and midwives over the issue. He said: "I recognise that the Queen Mother's and Yorkhill provide an important national service for the whole of Scotland and I am determined that such a service should and will continue. "At the same time I recognise the clinical arguments for having a maternity unit on the same site as adult clinical services. "I have therefore concluded, as did many who responded to the consultation, that the gold standard solution is a triple co-location of paediatric, maternity and adult clinical services." No decision has been taken on where the new hospital will be located, but the Queen Mother's will remain open for probably the next six years. One option is to develop the existing site. The £100m needed for the scheme was made available in the budget announced on Wednesday. An advisory group, featuring clinical experts, will now be appointed to monitor plans for the new development, which should be up and running by 2010. Mr Chisholm said he was confident that the health board would co-operate with the advisory group, but if it did not he would use powers to "direct" it. The board said it welcomed the announcement but that it remained "concerned about our ability to maintain maternity services on three sites". The minister has been under sustained pressure from opposition MSPs and campaigners against hospital closures in a number of places in Scotland. He has also come under scrutiny from Labour colleagues at Westminster, concerned about voter dissent over the NHS in the run-up to the general election. A number of MSPs welcomed the decision to reprieve the Queen Mother's Hospital during the debate. Liberal Democrat health spokesman Mike Rumbles said many health boards were not property accountable and were failing to discuss their proposals with neighbours. "The worst example of this is the building up of services at Paisley's Royal Alexandria Hospital in the Argyll and Clyde Health Board area and the Southern General in the Glasgow health board area, despite their very close proximity to each other," he said.